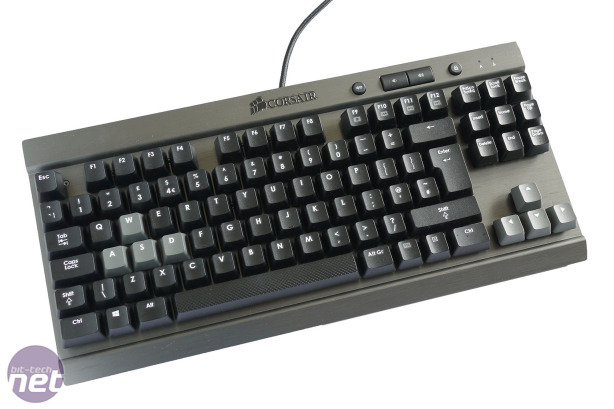 The Corsair K65 is the cheapest model in the company’s current range of mechanical-keyswitch keyboards, coming in at a mere £69. However this is only one of the reasons that we’re rather excited by the prospect of it. You see, what makes it cheaper is that it’s a tenkeyless design: that is one that lacks the extra set of numkeys on the right. While there are clear downsides to losing these keys, especially for those regularly entering large volumes of numerical data, for the majority they actually make a lot of sense. The main benefit is they reduce the space between your hands when using the keyboard and mouse, creating a more natural and comfortable position, which in turn reduces the strain on your wrists and elbows. Then there is the simple fact they take up less space on your desk. It’s easy to not even think about how much space a keyboard uses as we’re so used to them, but once you stop to think you realise that, particularly if space is at a premium, having duplicate keys isn’t exactly an efficient use of that space. Having established the general merits of tenkeyless keyboards, let’s take a closer look at whether the Corsair K65 is the one to get. 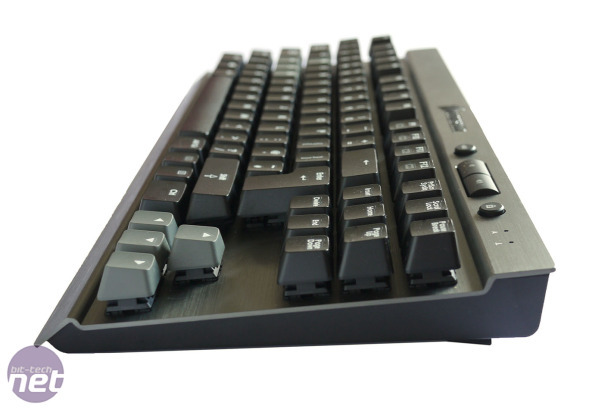 As we’ve come to expect of Corsair’s K series keyboards the K65 is a starkly elegant bit of hardware. Despite its low price it still sports the thick slice of aluminium that is the range’s signature with the keys left to sit proud on top of this rather than being sunken into the frame. The aluminium has a lovely brushed finish with a slight grey tint added to darken its lustre. 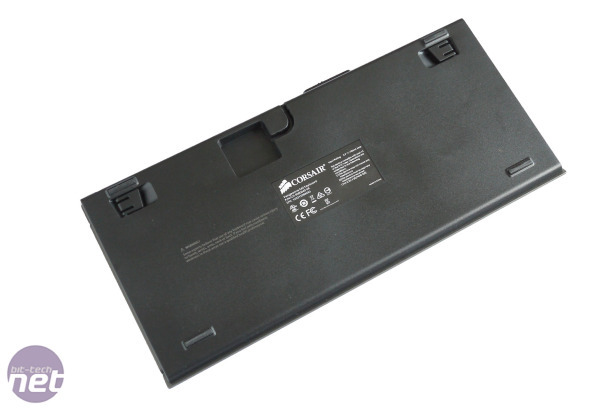 This is accompanied by a black plastic base and mostly black keys with white lettering. 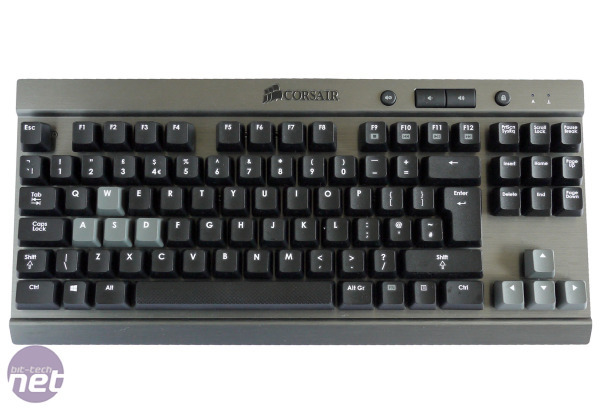 The WASD and cursor keys, though, are grey with white lettering. Finishing off the monotone approach are the Caps Lock and Scroll Lock lights which are brilliant white pin pricks. Build quality is good, though it’s worth noting the aluminium really is more for show than providing any structural benefit – the bulk of the thing is built from plastic. Also, those keys are a little more prone to being snagged thanks to their lack of any sort of protective surround. That said, we certainly had no incidents during our time with it. 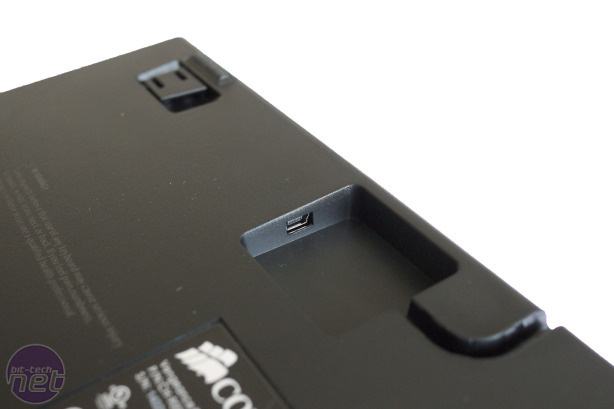 On the underside are the two flip out feet for raising the back edge, for those that prefer a more forward facing keyboard. The amount of height adjustment is fairly minimal (around 7mm), though as ever we prefer to type with the keyboard flat anyway. No wrist rest is supplied unlike with the rest of the K series. Under here is also where the detachable miniUSB cable plugs in, after routing through an angled channel. Whether a removable cable is really of much use from a travel perspective seems debatable but simply having the option to swap out the cable if it gets damaged is reason enough to want this feature. The supplied cable is a little short - again emphasising the portable potential – but you can of course easily swap this for a longer one.